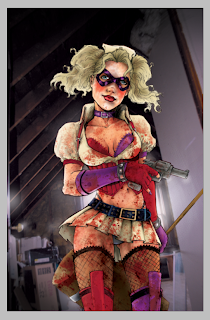 Just finished up painting Javier Avilas Harley Quinn. I've been picking away at it in short bursts for a month or two. 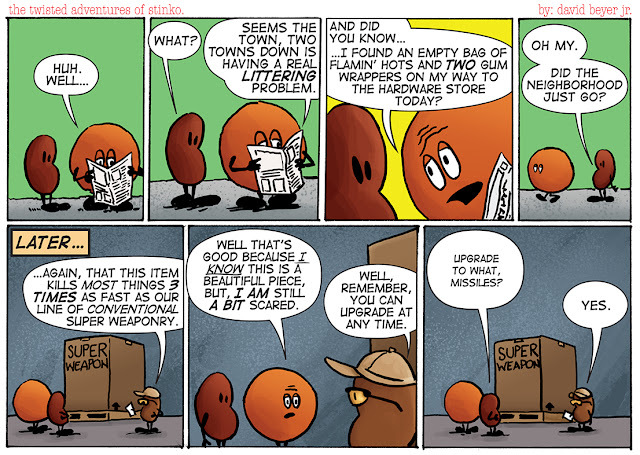 Here's the process as I remember it. So here are Javi's pencils he gave me. It's a pretty sweet, good girl pose for a lady maniac. 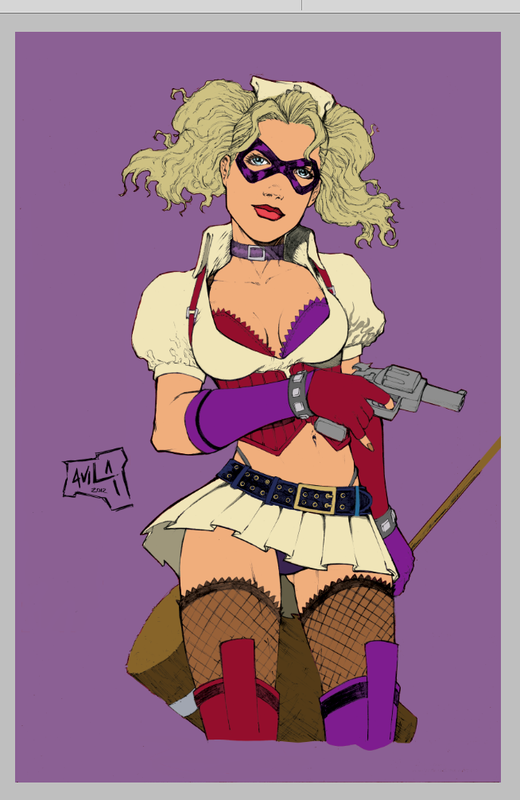 I dropped the flats in under his pencils and over a seperate purple background to get started. She's the Jokers girlfriend, I figured purples a good way to go. So here's where the piece really starts to move in the right direction. 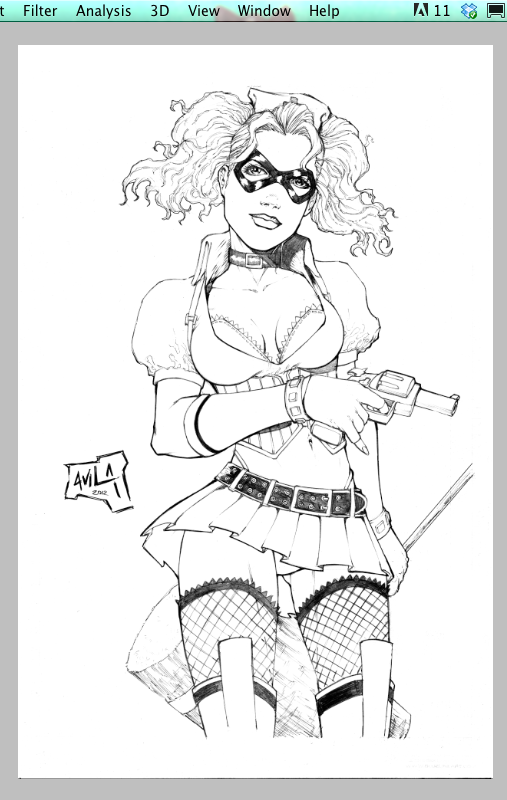 Javier had no background in his pencils. Between the last stage and this one, I had a few weeks where I was doing other things and this piece floated around in the back of my head. 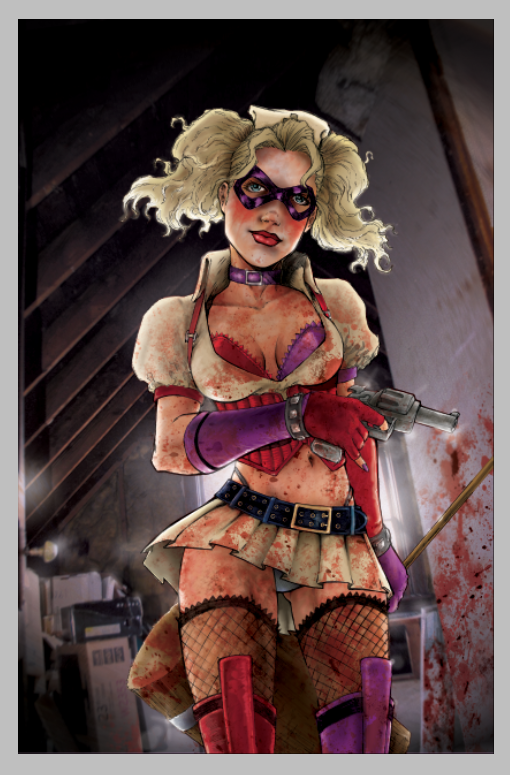 I was considering putting in a prison background considering Harleys origins in Arkham and where she is now with the Suicide Squad and their connection to Belle Reve. Then I thought, why would she be posing in this way inside either of those two places? All I really wanted out of those two locations was the kind of lines/ patterns that prison bars make. So I shot a photo of the unfinished part of our house where the furnace is. The window adds a nice light source, and the exposed beams gave me my pattern. I've also started adding highlights and shadows each in seperate layers. In next bit here I start manipulating the background to set it into Harleys space a bit more. I boost the contrast, knock down the overall brightness, and start to add lighting effects around her and objects in the room. 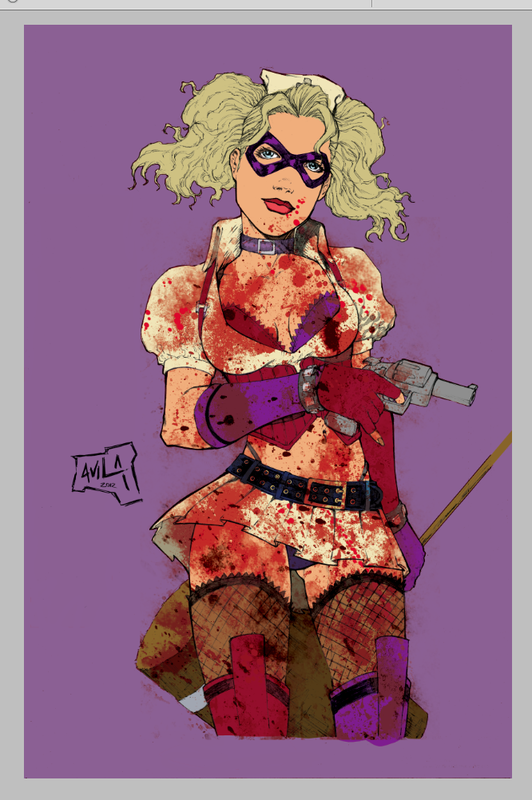 The blood is back, but was really out of hand, so I start chipping away at it. I cut parts out, knock other bits down and start integrating it more with her so it looks like it's on her skin and in her clothing, and not just a layer dropped into photoshop. 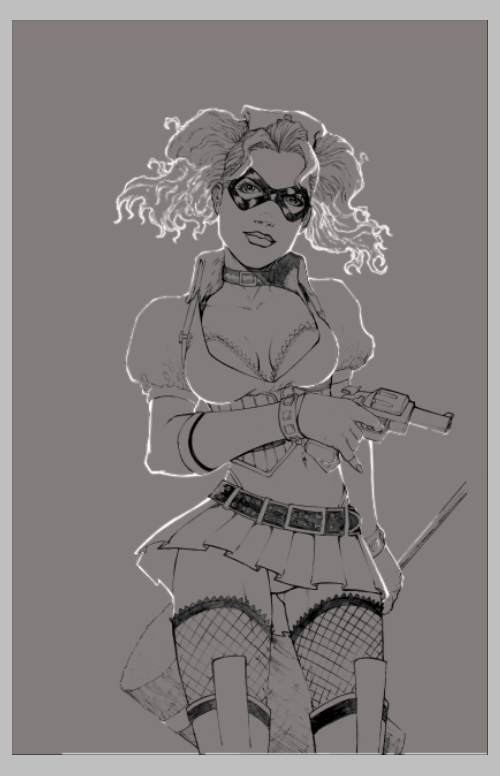 At this point I've also got a seperate layer for Harleys face makeup and other textures such as her skin and the corset. I'm refining the highlights and shadows further and have added more reflective bits to the metal objects in the piece. Blood splatter hits the wall after I realized the piece still needs a stronger narrative for this type of casual pose to work. I continue to work the shadows so the backlighting rings true. I've also dropped a couple of photo textures I've got into the piece to bring it together. 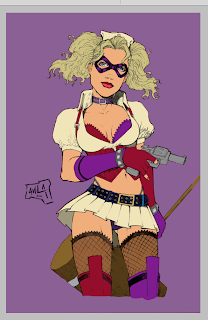 By this stage I've gone a little too far with certain parts and start to bring them back. I lighten bits where the shadows have flattened things out, and darken areas where the highlights have encroached into darker areas. Often I'll turn one layer off when working the other so I can see what I'm doing more clearly and inadvertently overlap the two. 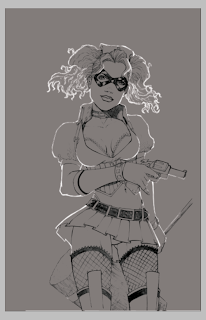 Some of the pencil layer is too dark for where the light shines around the edges of Harleys form. 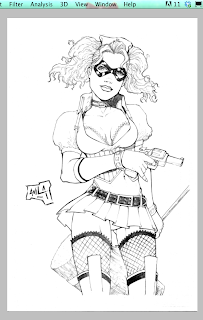 I created a seperate pencil layer and turn it white to increase the dimensionality of her figure.